In this review, we here at DBSatten Finance are going to take a look into this product by Greg Mercer. 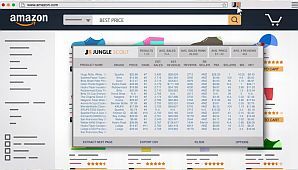 Through the Product Tracker of Jungle Scout, one can monitor his competitor’s inventory, pricing, profit margin, and more. These are crucial factors so you can identify the difference between success and failure in the competitive Amazon marketplace. It can present data needed to ensure a profitable product opportunity. Jungle Scout provides estimated sales and revenue. It estimates sales volumes by the best sellers rank. Amazon does not publish sales numbers. Although the software is packed with the leading technology, no guarantee is made to the precision of these figures. It is suggested that you use these as base estimates. Jungle Scout uses an in-house data collection system to accumulate over 1.2 million data points from Amazon sales every month. The data scientist builds models based on collected data to ensure that users always gather up-to-date and exact algorithms. At present, Jungle Scout provides full support for both the UK and US Amazon stores for the extensions. The web app is limited to the US. Jungle Scout is working to add support for all the Amazon stores. API Keys are required to use the complete functionality of Jungle Scout Pro. This is limited to individuals who own professional seller accounts on Amazon. Most Amazon sellers have a professional account. You can get it free for the first month. It is impossible for you to see data from the product dimensions, FBA fees, weight columns, and the number of sellers without API Keys. Jungle Scout makes Amazon research easier. There are three types of programs you can enroll. You can choose from Jungle Lite Extension, Pro Extension, and Web App. The Jungle Scout’s Extension will help you decide according to actual data. With a simple click of a button, you can see a product’s estimated monthly sales, revenue, or other criteria that are important in determining the profitable opportunities. The Monthly Sales & Revenue. Updates for 1 Year Included. The Spy on Competitors Sales. The Monitor Inventory & Rank. The Amazon Built for Sellers. I hope we helped you have a quick look at what Jungle Scout can offer you in this review. I have recently completed a course to sell on Amazon.com. I live in the UK but plan to sell in the USA. I have selected my product, opened my seller account, purchased junglecoutpro and am ready to place my first shipment order. My question is: Does Junglescout have a facility to assist me with keywords when i start writing my listing? Merchantword does that. You can find discount online where you only pay $9/month. It’s a good tool. Just starting out selling on Amazon, would I need both the extension & the web app? Was thinking about getting the pro extension to begin with, but they have a free trial for the web app also. Not sure which level to start with? Any advice?